"Team Krypton was just having #toomuchfun." 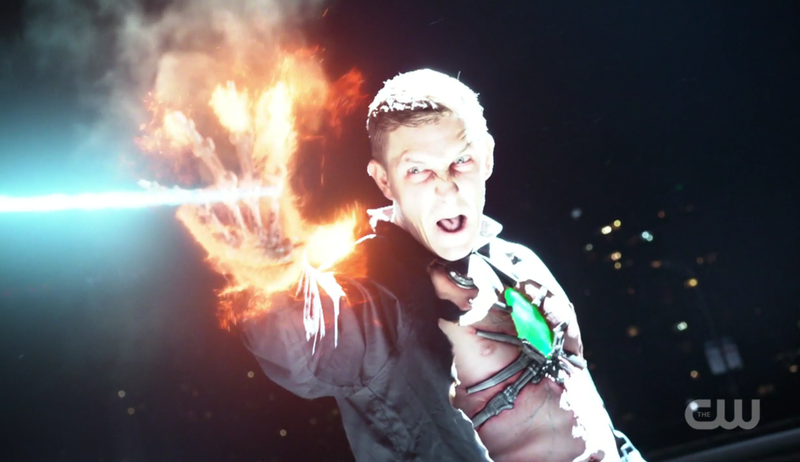 A strong second episode sees Supergirl and her cousin fighting Metallo and CADMUS declaring itself to the world while alter ego Kara tries to make headway as a reporter in CatCo. If you could call Season One anything, it was about Kara Danvers finding herself - establishing herself as Supergirl, separating herself from her Kryptonian family, first steps in love and in career. I'm wondering what the main theme of Season Two is going to be, and thinking after this episode it's going to be about Kara Danvers building a relationship with the world - because in this episode xenophobia comes to the fore, and it's all about CADMUS pushing an anti-alien agenda in the media (shades of Civil War?) which allows them to target Superman and Supergirl directly. Note: I'm a little bitter about that. Brenda Strong does a fantastic job as the malevolent CADMUS scientist setting Metallo loose in order to attack our Kryptonian team. After the events of last year, and Hank getting reinstated as DEO director, why isn't the Government sending support for Superman and Supergirl when a huge broadcast goes out? They'll take what help they can get, but when actual help is needed in return, who, what Kryptonian, we have Kryptonians here? It'll be interesting to see how this plays out in the media in Supergirl's world, especially without Cat to run the narrative. To continue: this episode is also about Kara and Alex finding their own relationship. 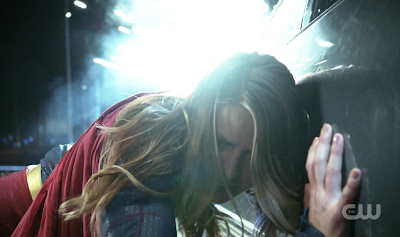 Kara has been having #toomuchfun with Clark, saving the day from x and y alike. Alex has been standing quietly on the sidelines. When Metallo attacks, and it becomes clear someone's targeting Kryptonians, Kara accidentally ignites Alex' rage by suggesting Kara move in with Clark in Metropolis in order to avoid endangering National City. These two depend on each other for so much, but it's got to be seductive for Kara to hang out with other superheroes who have similar ranges of powers and not have to be careful to hide who she is all the time. She wasn't indoctrinated with that as a child; she has to pretend all the time. Clark's 'act' seems a lot more polished in comparison to Kara's 'act' when he interacts with Mr. White (he actually comes across as kind of a grown-up Radar from M*A*S*H to me.) And neither of them want to push the other; they both want the other to make honest decisions. It's a tough place. Kara's also got to deal with how her new boss, Snapper Carr, sees her. To be fair, I totally get how Cat is approaching this. Kara wants the job? Well, she has Cat's support, but like Snapper says, Kara has to earn the job, and can't be asking for help all the time. In a series where everything seems squeaky clean and pretty - especially now that the DEO has moved - Ian Gomez brings an element of real-world grittiness to Kara's life I think is going to be sorely necessary. This isn't being challenged to get the perfect cappucino. This is being challenged to write creative pieces with meaningful relevance. But is Kara going to ever earn Carr's respect? This whole theme of relationships and finding balance in relationships continues with Clark and Hank, actually, in a more concrete way; the two of them are fighting over control of Kryptonite, with Clark claiming if Hank trusted Clark he'd hand over the Kryptonite, and Hank saying if Clark trusted Hank he'd shut up. The two of them have this fantastic conversation in the Fortress of Solitude - a very intense, powerful discussion about Hank's motives in preserving balance. I actually can't see why Clark doesn't see Hank's side of the argument. In fact, the only one not touched by the relationship theme is possibly Winn, who is a winner here; he totally loves his new job, and was completely wasted as a tech support guy (I empathize. I was once a tech support guy). He's pulling out invention after invention, being snarky with the boss, and, well, don't tell him I said this, but it's like the Toyman turned good, as if he had some latent invention gene he could tap into. Wasn't he totally cute when he got to design Superman's suit? And that hug at the end? OMG. I love how Supergirl resolves the Metallo issue: with a Plan. Barry would be proud; remember when he accidentally ran into her world, and she was just charging into situations? Kara brings together all elements of the team - Clark and Hank, Kara and Alex - in ways that force them to resolve their problems and realize their value to each other. My only problem here was whoa, violent! Basically both Metallos were stabbed through the heart. I loved how Supergirl instantly realized there was a camera there and puts forth the challenge - the CADMUS leader's response is chilling. We're gonna have an interesting season. Kara also has a Plan for Carr too - cranky face, poor insults, and a really well-written article. She still has a long way to go, but the sweet smile as her hard effort wins her a crack in the door makes me grateful for the existence of Melissa Benoist. Working together seems to resolve a lot of Clark and Hank's issues, too - and maybe some of that is CADMUS, maybe some of that is our Winnvention of the week rendering the whole point moot: if some random genius can invent anti-Kryptonian fashion wear in a couple of days, maybe Clark is worrying a leeeeeetle too much about the whole thing. I'm glad: these two have a lot in common, including maybe taking themselves just a tad too seriously. I'll miss Tyler Hoechlin, but I think both he and Calista Flockhart will continue to be regulars. Busy episode, but the writers pulled off a great Superman visit, a convincing CADMUS villain, two convincing powerful Metallo stooges, and a new job - but even the pod guy gets a spotlight. Supergirl shares her relationship lessons with him, and this touching moment ends with the Mysterious Handsome Shirtless Stranger reaching out and grabbing Supergirl by the neck. Never a good sign, even if he is Shirtless and Handsome. All the moments when Clark and Kara are saving lives and fighting together, from the fire to the thieves. Cat telling Kara she is not going to scold Kara's new boss for her and that it's time for Kara to stand up for herself. Love. I actually like the whole tough-reporter-life type of story, and I'm looking forward to seeing Kara develop this way and get the tougher skin Carr seems to already have. The image of Martian Manhunter's fist phasing through Metallo's chest to take out his Kryptonian heart. So comic book. Metallo seems 'over' here but I thought he was going to be a bigger bad than this - too bad, as he was fairly menacing. The first one, anyway, the second one seemed dopey. Hank: We're both men without a home, Kal. If we don't preserve each other's history, who will? Clark: You can't offer friendship with one hand then take it away with another. Hank: Because Mars is a crypt. Because angry gods burned our young and we were helpless to stop them. Snapper: You don't just become a reporter. This isn't a Facebook status update. You're a reporter because you went to journalism school or because you walked the beat. Either way, journos live to tell stories, to get to the truth, to get their hands dirty. Cat: Have I ever told you my name is Catherine? Supergirl: I'm not telling you my real name. Cat: I had to try. 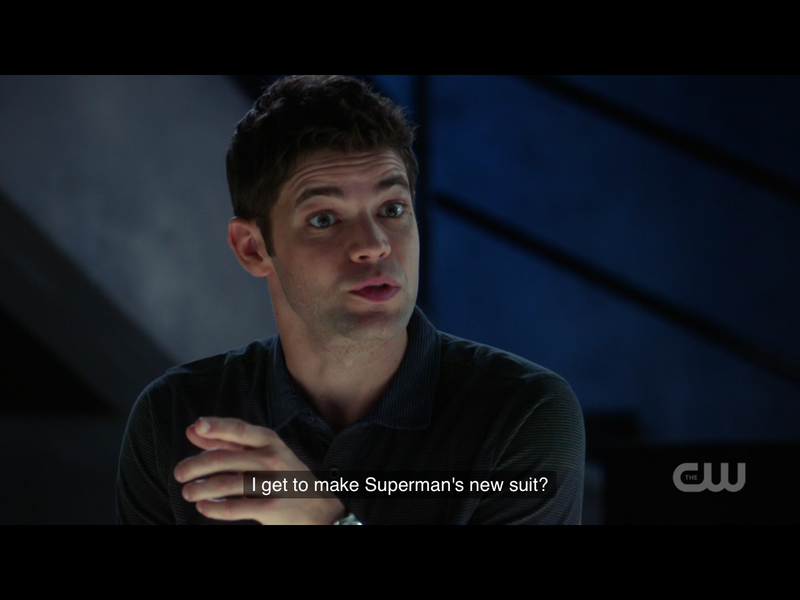 Winn: Okay, so, this is a bit of a rush job, but they should keep you alive. What do you think? Kara: (to Winn) Are you crying? This was an amazing hour of Supergirl. So far, loving the CADMUS villainry, and wondering what we'll find behind it. Five out of five plastic chest shields which are the HEIGHT of superhero fashion. Yeah, I really loved it, too. It's like Supergirl has finally become the series it was promising it could be. They're giving Melissa Benoist a real character to play, genuine conflict, a chance to grow. The K-conflict between Kal and Hank made sense, and moving Winn to the DEO was the exactly perfect right thing to do with him because he was terrific in a Cisco sort of way. I get that Cat and Kal are now in the guest star realm, but what just happened to James Olsen? Is Mehcad Brooks still in the cast? Great review, Joseph! Thanks for helping out! I can't believe no one else has mentioned how in one of the first Arrow/Flash crossovers, Oliver spent a good deal of time explaining to Barry how he needs a plan and to stop going into situations expecting to come out on top just because he has powers.And then last season Barry imparted the same wisdom to Kara.